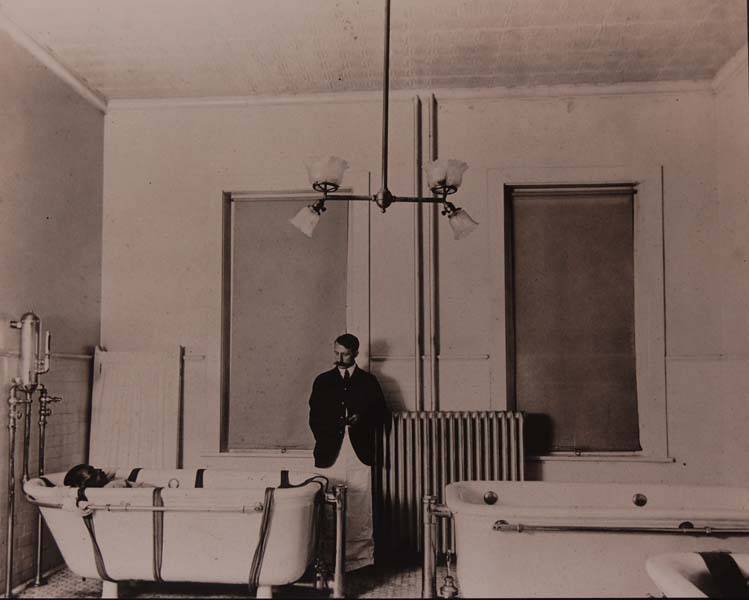 Hydrotherapy was a popular method of treatment for mental illness at the beginning of the twentieth century, and was used at many institutions, including the London Asylum for the Insane. Water was thought to be an effective treatment because it could be heated or cooled to different temperatures, which, when applied to the skin, could produce various reactions throughout the rest of the body. One of the main benefits of hydrotherapy treatment was its ability to take effect quickly. Hydrotherapy could be accomplished with baths, packs, or sprays. 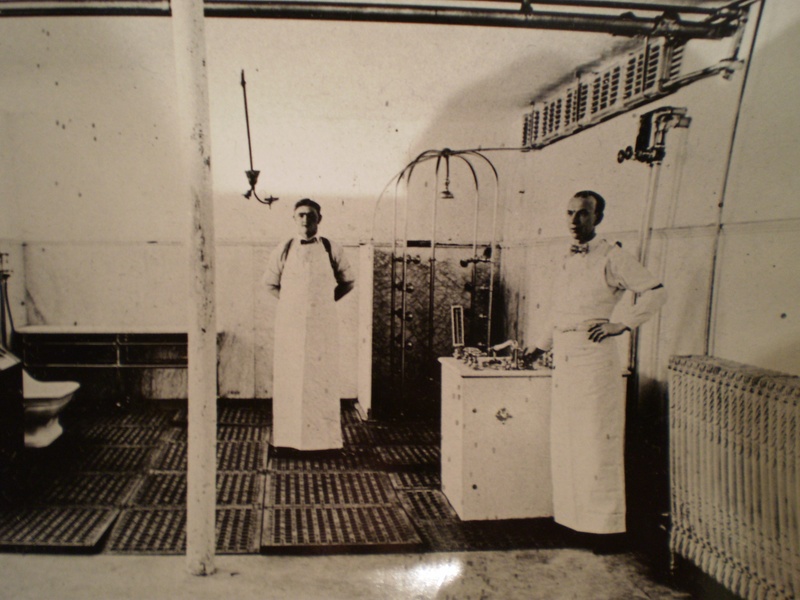 Warm continuous baths were used to treat patients suffering from insomnia, those considered to be suicidal and assaultive, and calmed excited and agitated behaviour. A patient could expect a continuous bath treatment to last from several hours to several days, or sometimes even over night. Continuous baths were the most effective when held in a quiet room with little light and audio stimulation, thus allowing the patient to relax and possibly even fall asleep. Bath temperatures typically ranged from 92°F to 97°F, so as not to cause injury to the patients. Packs consisted of sheets dipped in varying temperatures of water, which were then wrapped around the patient for several hours depending on the case. Sprays functioned like showers, and used either warm or cold water. 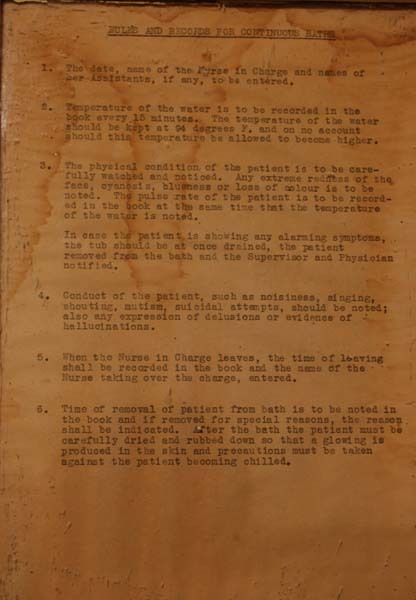 Cold water was used to treat patients diagnosed with manic-depressive psychoses, and those showing signs of "[e]xcitement and increased motor activity." Application of cold water slowed down blood flow to the brain, decreasing mental and physical activity. The temperature for a cold pack ranged between 48°F and 70°F. Hydrotherapy was used throughout the early twentieth century at the LAI.